What’s In a Name? | Does This Font Make Me Look Fat? What’s in a name? A lot, it turns out when you’re a writer. You have a character in mind, but you need a name. And it’s not like naming a baby where you get to pick a name you like. Writers need to find names that (hopefully) tell the reader something about the character. The problem is when you begin to write a new project you don’t really know your characters yet. Laura and I started on a new screenplay this week. Another Christmas movie. We had a general idea of what the movie would be about. Our thought was that we would begin by figuring out what each character wanted. It quickly became obvious that it was confusing to talk about characters without naming them. We had started ten steps down the path, so we went back to the beginning. Main female character. Main male character. A secondary love interest. A father. How hard could this be? What do we want these names to tell us about the character – a character we don’t really know yet? These people aren’t fully developed in our minds yet, so a name we pick now might not fit a couple of weeks into the project. Place holders would have to do for now. Out came the What to Name Your Baby book. We think (still early days) that the main female character is mid-thirties. Google told us the most popular girls’ names in 1979, but none of them seemed right. After an hour an a half we had three names. I’d forgotten how difficult naming characters could be. We were also struggling with the overall arc of the story. The main female character didn’t have a change moment. She was the same at the beginning as she was at the end. That doesn’t work. Laura remembered reading in Stephen King’s book On Writing that if something about your story wasn’t working, try flipping the characters. So we flipped the male protagonist with the female protagonist and suddenly the story worked. But now the names didn’t work anymore. Back to the baby book and Google. By this point we were an hour past lunch time and getting a little goofy. On Google we found a link for how to generate a Christmas elf name for yourself. This was just the diversion we needed. My Christmas elf name is Pompom Frosttree. The website tells me Pompom is a bit of a show-off who likes to climb the Christmas tree and be the center of attention! She wears a handsome tunic embroidered with frost patterns, and she makes magical scooters and bikes for all the good little children. Fits me to a T.
Laura’s elf name is Treacletart Silverbubbles. Treacletart is a bit of an airhead who forgets how to do things, but is loved by all the other elves for being so happy! She wears a sequined jacket with shiny silver buttons, and she makes delicious puddings and cakes for all the good little children. Note to reader: Laura has a jacket just like that and she is a really good cook. I’m not going to tell you the names we chose for our characters, but here are their Christmas elf profiles. Maybe you can figure it out. Our main female character: Marshmallow Jinglebaubles. She is very creative, has a sharp eye for art, and loves to decorate the grotto! She wears pointy green shoes with bells on the end, and she makes tasty marshmallows and chocolate covered candy for all the good little children. Our main male character: Partridge Fairybells. 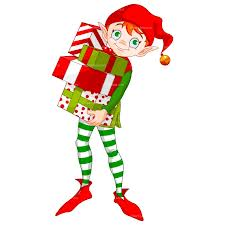 He is a fun-loving prankster who loves to play silly tricks on the other elves! He wears a pale green tunic of fine silk embroidered with gold stitches, and he makes magical marbles and lucky dice for all the good little children. This silliness didn’t accomplish anything for our script, but it cleared out heads to work again tomorrow. The names we chose today may not be the names we end up with. Sometimes characters tell you what their names are and, when they do writers need to listen. This entry was posted in choosing character names, Laura Ambler, Mala Burt, Script Writing, Transformational Arc, Writing, Writing Resources and tagged Choosing character names, Christmas, Laura Ambler, Mala Burt, naming characters, writing resources by Mala Burt. Bookmark the permalink.